Only it's not what you think. Acura won't be rolling out a new performance hatch anytime soon. 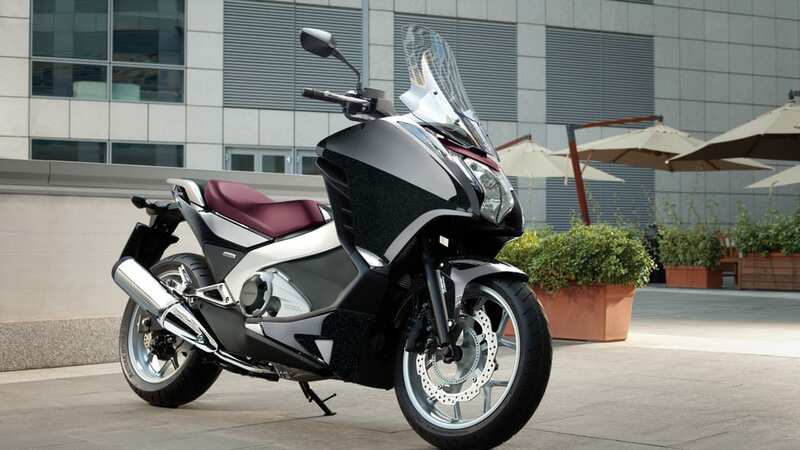 Instead, Honda Motorcycles has pulled the sheets off of a new two-wheeled Integra model at this year's EICMA show. The vehicle is effectively an overgrown scooter with a 670 cc engine and an optional dual-clutch gearbox. Honda says the vehicle is meant to meld the motorcycle and scooter worlds with plenty of performance, great fuel economy and superior accessibility thanks to its feet-forward riding position. Buyers will be able to chose between two engine specifications, with most Integra models boasting somewhere in the neighborhood of 52 horsepower. European buyers, meanwhile, will be able to opt for a slightly less potent variant with around 47 horsepower to meet 2013 European Union A2 licensing requirements. Honda says that both engines are specifically engineered for peak performance below 87 mph and 6,000 rpm, where the company says that 90 percent of riding typically occurs. All of which is well and good, but the name of this thing is a subtle jab to the ribs for those holding out hope for an affordable performance hatch from the Japanese brand. Check out the gallery and hit the jump for the press release. 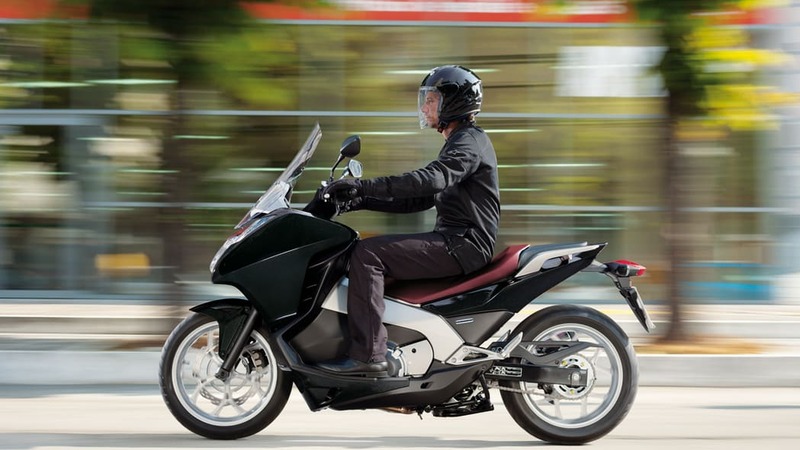 The Integra takes its name from the fact it integrates the ease of use of a scooter with the dynamic performance of a motorcycle. 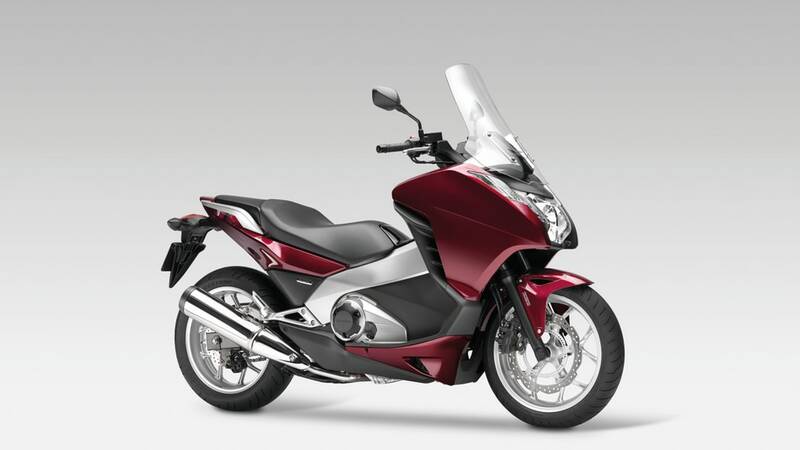 It has a feet-forward riding position, protection from the elements, internal storage and the option of an automatic transmission in the shape of the second generation of Honda's innovative Dual Clutch Transmission; at the same time it offers stability and handling not found on a scooter. The result is a unique and desirable modern machine, conceived to deliver a totally engaging riding experience while benefiting from the environmental and safety technologies customers expect of a 21st century vehicle. At the heart of this new machine is a purpose-built engine and transmission package. The liquid-cooled, in-line 2-cylinder 670cm3 engine is a lightweight and compact unit positioned to give a low centre of gravity. It offers strong torque at low to medium engine rpm, where riders spend the vast majority of their riding time, together with a very usable power delivery, low exhaust gas emissions and superb fuel efficiency. The engine works with the second generation of Honda's innovative Dual Clutch Transmission, which provides the convenience and ease of use of an automatic with the optional control of a manual mode should the rider choose it. Either mode offers clear benefits compared to more conventional CVT transmissions. Keywords like 'fun', 'easy', 'comfort' and 'safety' helped inform the design and engineering of the Integra. Although the new engine and Dual Clutch transmission were critical to fulfilling the brief, the chassis too had to be truly versatile. Responsive handling was a given in order to deliver an involving and enjoyable riding experience, but the machine also needed the stability and ride quality required to commute on all kinds of roads. 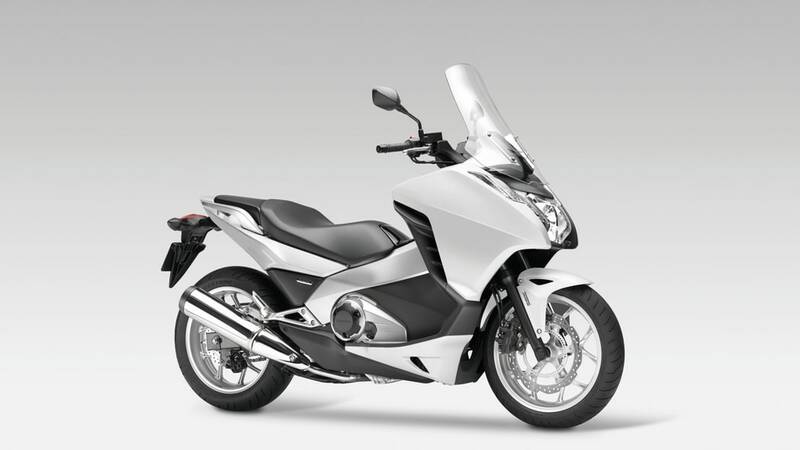 Mounting the engine and advanced transmission in a rigid steel diamond frame, the Integra offers the stability and handling performance of a conventional motorcycle. High-specification suspension, CBS and ABS, large-diameter 17" wheels and wide 120/70 front and 160/60 rear wheels and tyres further enhance the riding experience. An all-new 670cm3 in-line two cylinder unit developed to offer superb fuel efficiency (27.9km/l) together with strong performance particularly at low and medium engine rpm, the engine is key to the Integra's fun riding experience and all-round versatility. The Integra's Dual Clutch transmission uses two clutches to deliver fast and smooth gearshifts in a choice of three modes. Manual (MT) allows the rider to shift gears using triggers mounted on the left handlebar, while automatic mode (AT) offers two settings: S for sporty riding and D for urban and highway use. The Integra is a bold and original styling statement, fusing new forms, slick surface treatments and strong lines. It offers a high level of wind protection and a relaxed, comfortable riding position. The Integra is truly a new concept, with its own exciting functionality and unique style. The New Mid Concept, shown at the 2010 Milan motorcycle show, blended the feet-forward riding position of a scooter with aggressive lines inspired in part by Super Sports motorcycles. The Integra takes these themes and moves them forward to clearly communicate its intention to deliver unrivalled fun and versatility. The Integra's distinctive face consists of a multi-reflector headlight unit and indicators united in a strong V configuration. The powerful headlight, with its striking multi-reflector design, gives an impressive light spread for comfortable night riding. The eye is then lead into the large, protective windscreen. Every part of the bodywork has been sculpted to offer both smart good looks and functionality. The frame-mounted front cowl delivers high levels of wind and weather protection. It also incorporates aerodynamically efficient air intake and exhaust ducts for superb cooling performance. Cooling of the engine and exhaust system is helped further by the under-cowl, which links seamlessly with the machine's strong feature lines while also ducting cool air onto these key components. The design of the under-cowl is complemented by the mechanical-looking engine and transmission covers, which hint at the advanced engineering inside. The Integra's lean, energetic lines converge in the elegant tail, which is cut strikingly short, underlining the machine's Super Sport design inspiration. 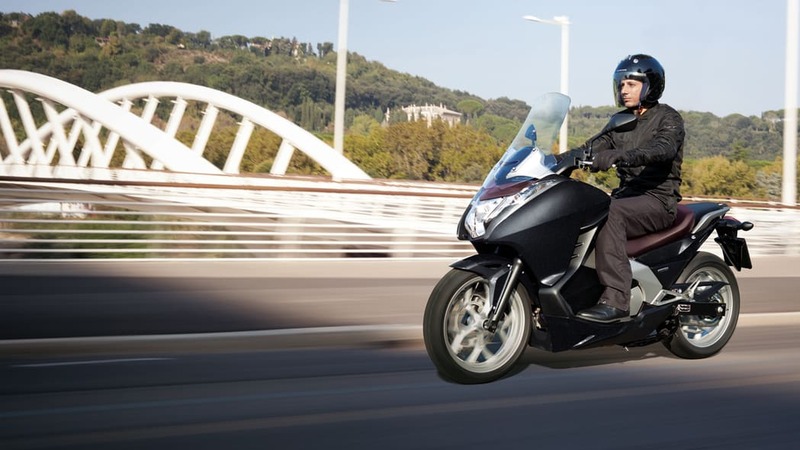 Despite its slim proportions, the Integra features a 15-litre under seat storage space large enough to hold a Demi-Jet open-face helmet or waterproof suit. Together with the fuel filler cap, this space is accessed using a key to unlock and flip up the seat. This mechanism is damped, so that even if the open seat is dropped it shuts securely with a smooth action. The main fairing also offers a second, smaller storage compartment within easy reach of the seat – ideal for tickets, wallet or mobile phone. A power socket is also provided, to allow the use of accessories such as a mobile phone charger or navigation system. Finally the body contains a large 14.1-litre fuel tank. Together with the highly fuel-efficient engine, this fuel capacity helps deliver an impressive range of nearly 400km (250 miles) between fill-ups, based on a WMTC figure of 27.9km/l. One of the great attractions of a scooter is the freedom and ease of use associated with the feet-forward riding position. 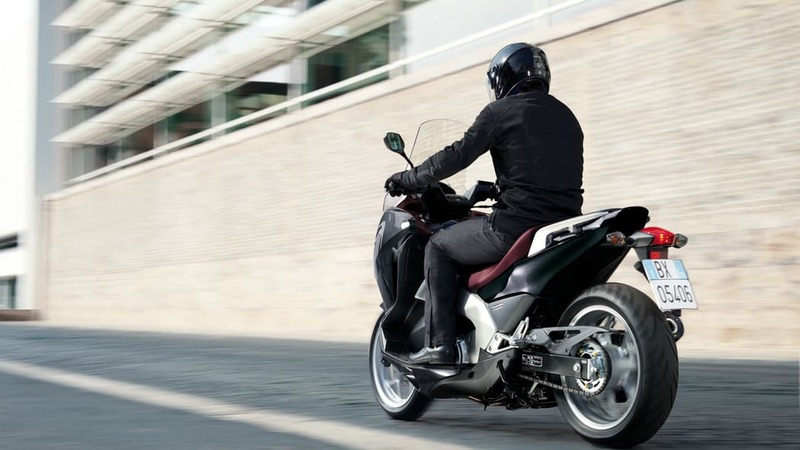 With no foot controls requiring a fixed foot position, the Integra offers this same simple degree of freedom, with seat and handlebar relationship that loosely defines a space within which the rider and passenger are free to relax. The low 790mm seat height ensures confidence and control, even during low-speed manoeuvres, and the carefully sculpted seat shape makes putting a foot down easy. Passenger comfort is further enhanced by the seat design, which is split into two parts but with a small height differential between the rider and passenger. Twin grab rails, one on each side of the rear seat, further reassure the passenger, as do the secure and retractable rear footrests. Positioned to keep the rider's eyes on the road and to deliver essential information at a glance, the Integra's comprehensive and attractively styled instrument display includes a digital speedometer, a digital bar-type tachometer, a clock, a bar-type fuel meter and two trip meters. The Integra features conventional motorcycle wheels and suspension, and a rigid tube steel diamond frame with geometry optimised to create a sense of excitement and complete control. Overall chassis stability is further enhanced by the Integra's weight distribution. The engine has been mounted low in the frame. It is also tilted forwards, tuning the chassis' weight distribution for stability together with easy handling at all speeds, from stop-start city riding to high-speed highway cruising. Conventional steel tube frames use two loops, running around the engine and gearbox unit, to link the headstock and swingarm pivot. Instead, and to take advantage of the very compact engine, the Integra uses a lower and much simpler frame design, with just two main tubes linked by a single cross-tube. This solution ensures a low centre of gravity, a mass-centralised weight distribution for agile, stable handling and low weight, since the number of component frame tubes is reduced. The diameter and wall thickness of the frame tubes has been optimised to provide secure handling together with the flexibility to absorb harsh shocks and engine vibration. Thanks to 120mm of smooth fork travel, the hydraulically damped 41mm telescopic forks deliver fine control and stability on even the roughest roads. The rear suspension system uses a Honda Multi-Action System (HMAS) monoshock damper, which generates the optimal damping force under both compression and rebound. The damper works with Honda's Pro-Link configuration for a high standard of ride quality and excellent traction at all times. The Pro-Link system is also compact, reducing suspension weight while also helping deliver a package that combines both an internal storage space and a good-sized fuel tank. The 570mm swingarm combines rigidity with the optimum degree of flex thanks to its steel construction, which is rectangular in cross-section (75mm x 35mm). Nowhere is the Integra's commitment to a rewarding, motorcycle-inspired riding experience more evident than in its wheel sizes. The Integra runs on 17" high pressure die-cast aluminium alloy wheels front and rear, which is a first for Honda. The spokes feature a Y-shaped cross section to help absorb shocks, contributing to the ride quality. These large-diameter wheels bring stability and composure under hard cornering that no conventional scooter on small-diameter wheels could hope to match. Broad radial tyres front (120/70-17) and rear (160/60-17) ensure high levels of grip and traction for swift and secure running in all road conditions. A lightweight, sealed 520-size chain offers low levels of friction while also helping reduce unsprung weight. The C-ABS on the Integra is equipped with both the easy control of a Combined Brake System and the extra reassurance of an Antilock Brake System. The CBS effectively balances front and rear braking control for smooth operation. At the same time, the ABS provides extra reassurance and the confidence to build skills in unexpected or extreme situations. Early in the development of the Integra, new research yielded some key data regarding the typical engine use of a rider commuting on a mid-capacity machine. The research revealed that 90% of riding involved speeds of 140km/h (87mph) or less and engine speeds of 6000rpm or less. 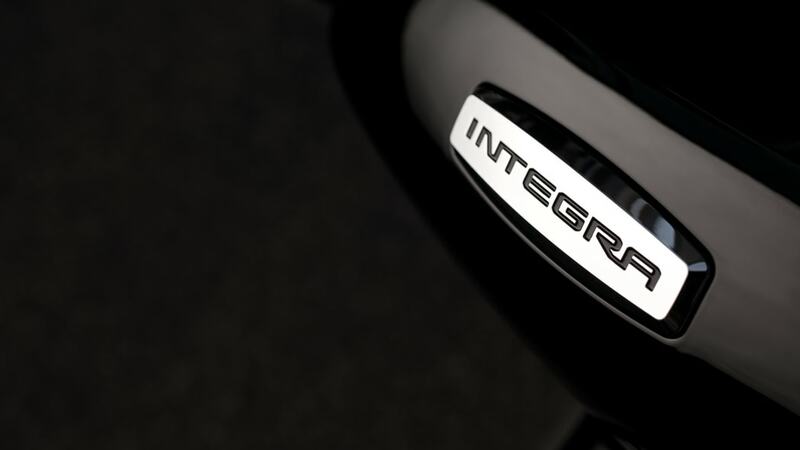 The Integra demanded a new engine ideally suited to this kind of usage, with strong torque characteristics in the normal rpm range coupled with ease of use and low maintenance. Outstanding fuel efficiency was also a priority. The team set a very ambitious target: to increase fuel efficiency by 50% compared to conventional engines of the same displacement. The Integra's liquid-cooled SOHC 670cm3 twin-cylinder engine is ready to meet the challenges of the 21st century. Thanks to its bore and stroke dimensions, SOHC architecture and specially shaped combustion chambers, it delivers strong, easy drive from the moment the throttle is applied. Further enhancing this satisfying feeling of effortless torque is the crankshaft, which has been designed with relatively high levels of inertial mass. The Integra will be available with two different specifications of engine. One produces a peak power output of 38.1kw at 6,250rpm and 62Nm of torque at 4,750 rpm; the other, specifically offered with the 2013 A2 European licensing regulations in mind, produces 35.0kw at 6,250rpm and 60Nm of torque at 4,750rpm. Rider satisfaction is further enhanced by 270° crank phasing and uneven firing intervals, which work together to provide a pleasing throbbing feel and something of the emotional connection of a V-twin engine configuration. In order to manufacture a suitably lightweight 270° crankshaft, a new production method was devised. Using a procedure Honda also employs in its V6 car engines, the crank is forged at a 180° angle before being twisted precisely through a further 90°. The result is a lightweight and low-waste 270° crankshaft. The primary vibration of a 270° crank can be balanced perfectly using a biaxial balance shaft, giving the two cylinder engine the smoothness of a Gold Wing's horizontally-opposed six-cylinder engine, but the Integra was deliberately designed with a uniaxial primary balancer, which delivers smoothness together with a satisfying engine feel. This feel is further enhanced by the collective intake port design of the cylinder head. This arrangement means there is some interference between the gasses flowing into the two cylinders. Together with the valve timing, which is set differently for each cylinder, the result is a unique and distinctive feel to the engine. Development of the Integra's engine has made extensive use of stoichiometry, the science of chemical reactions, which involves calculating the ideal quantities required to bring about the desired reaction, and the amount of product produced by it. By analysing engine combustion in this way, the Integra's engine has been developed to deliver exactly the fuel/air ratio required for a complete, clean burn at all engine rpm and in all running conditions. An efficiency target of 27km per litre in WMTC (D-mode) drove the development of this engine, but in tests this has actually been bettered. This outstanding fuel efficiency is also the result of very low levels of friction within the engine, thanks partly to the relatively low number of moving parts. For example, instead of being driven by an additional shaft, the oil pump is driven by the balance shaft, while the camshaft also drives the water pump. A resin coating on the pistons also reduces friction within the engine, as do the lightweight aluminium roller rocker arms. Developed as an integrated part of an innovative new machine, the Integra's engine is space efficient, leaving room in the body for storage compartment and a spacious, comfortable riding position. To achieve this, the engine uses a number of space-saving solutions including a compact single exhaust system and fuel injectors mounted directly into the compact liquid-cooled cylinder head. The result is power, torque and refinement in a compact and manageable machine. Thanks to the same stoichiometric calculations that reduce fuel consumption and maximise torque, the Integra's EURO3-compliant engine also burns very cleanly, minimising the emission of harmful exhaust gases. The PGM-FI fuel injection system also contributes here, supplying precisely the amount of fuel required thanks to an oxygen sensor in the exhaust. Finally the high-absorption catalyser has been located close to the engine. As a result the catalyser reaches operating temperature more quickly after a cold start, reducing harmful emissions over a typical journey. A product of Honda's ongoing desire to use new technologies to bring fun and convenience to peoples' lives, Dual Clutch Transmission uses automated clutch and gear shift operation to deliver the same riding enjoyment as a manual transmission with the convenience of an automatic. More compact and lighter than the original Dual Clutch Transmission system that debuted in 2009, the next generation unit continues to fuse the control and fuel efficiency of a manual system with the ease of use of an automatic, and opens up this innovative and exciting technology to a new group of consumers. As the name implies, the system uses two clutches: one for start-up and 1st, 3rd and 5th gears; and another for 2nd, 4th and 6th. By pre-selecting the next gear using the clutch not currently in use, the system can electronically switch clutches when required to deliver swift, smooth and seamless gearshifts. This smoothness is particularly beneficial when carrying a passenger. The second generation Dual Clutch Transmission has been refined to suit a diverse range of uses, from urban commuting to touring. To ensure the optimum shifting schedule, extensive testing was conducted on all kinds of European roads, including the busy streets of Rome. The Integra's Dual Clutch Transmission offers three modes of operation for outstanding flexibility. MT mode gives full manual control, allowing the rider to shift gears with the handlebar controls. Ideal for use on winding country roads, MT mode gives a level of rider involvement and satisfaction not achievable with a fully automatic transmission. The Integra's Dual Clutch Transmission also offers two automatic shift modes for convenience and ease of use. D mode is ideal for city and highway riding while S mode enables rpm to be maintained at a higher level for faster riding, giving greater performance and higher levels of engine braking for sporty riding. In either D or S mode the second generation Dual Clutch Transmission now offers immediate manual intervention if required. 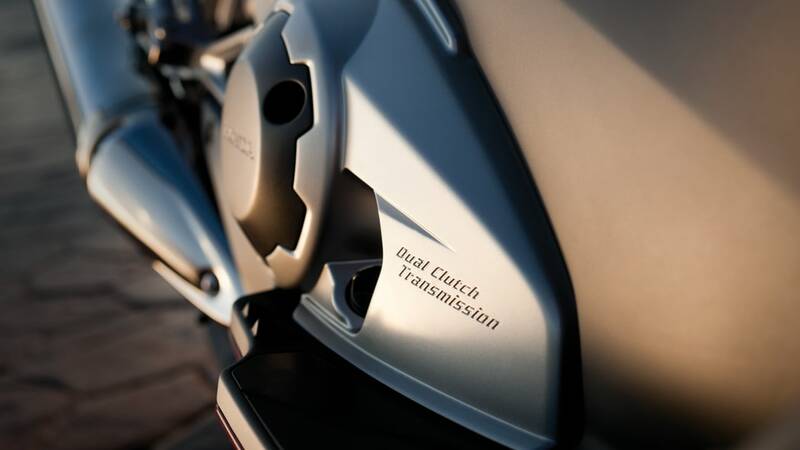 The rider simply selects the required gear using the MT mode shift buttons, after which the Dual Clutch Transmission will continue to act as an automatic transmission. This is particularly useful when preparing to overtake or when approaching a tight corner on a twisty hill road, for example. Designed to offer convenience and low running costs, the Integra's engine and transmission require the bare minimum of maintenance. The Dual Clutch transmission uses heavy duty large-diameter clutches to comfortably deal with the rigours of daily use in stop/start city traffic without the need for a first service to check valve clearances. Service intervals are every 12,000km, and the engine's highly efficient iridium sparkplugs only require replacement at 48,000km. The versatility of the Integra can be further enhanced with a range of genuine Honda accessories. These hard panniers increase luggage capacity without making the Integra too wide to slip through congested city traffic. Capacity is 29 litres. Fit these attractive colour panels to personalise the optional pannier kit. These inner bags fit neatly within the panniers, making loading and unloading more convenient. This 40-litre hard plastic top box increases practicality by providing a large and secure storage compartment. With 35 litres of capacity, this top box ensures ease of use by virtue of its one-key functionality. These additional bodywork panels mount to the main body of the vehicle, further improving the Integra's already impressive levels of wind and weather protection. Wires in to the Integra's electrical system to provide a powerful anti-theft deterrent. As befits a vehicle intended for all-weather use, the Integra can be enjoyed with heated grips, which keep the rider's hands warm even in cold weather. This breathable and waterproof outdoor cover is ideal for protecting the Integra from the elements, and keeping it hidden from prying eyes when parked on the street overnight.